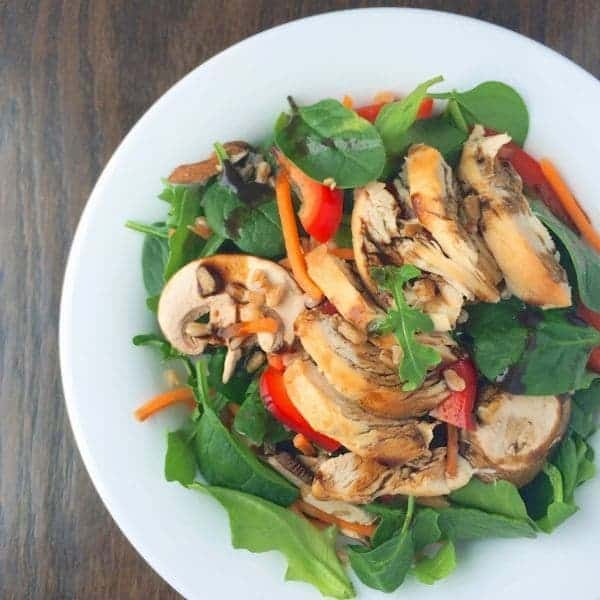 Lean chicken breasts and chewy farro give this spinach salad a major boost of protein to give you long lasting energy. My Spinach Power Salad with Chicken and Farro is my husband’s favorite make-ahead brown bag lunch. In fact, once I made it for him the first time he started requesting it on a weekly basis. As a healthy food blogger with a picky husband, I can’t tell you how much joy this brings me. Creating his lunches for the week has actually become a bit of a Sunday afternoon ritual for the two of us. We love being in the kitchen together and I love seeing him take charge with these salads. He always picks out his favorite veggies and asks for different grains each week. 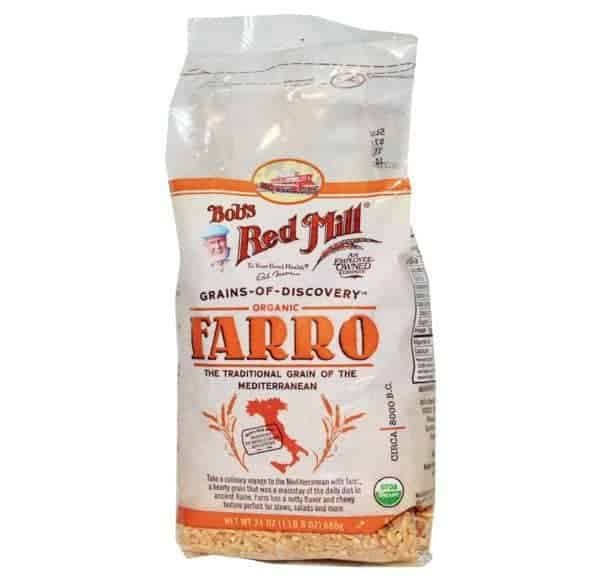 On this particular day we used farro but wheat berries and spelt also do a great job of maintaining their chewy, nutty texture throughout the week. If you’ve never tried farro, I encourage you to give it a try. Packed with protein, fiber, vitamins and minerals, this ancient grain is an affordable and versatile source of energy. We love it with stir fry instead of brown rice or as a quick side dish in my Greek Style Farro Salad. 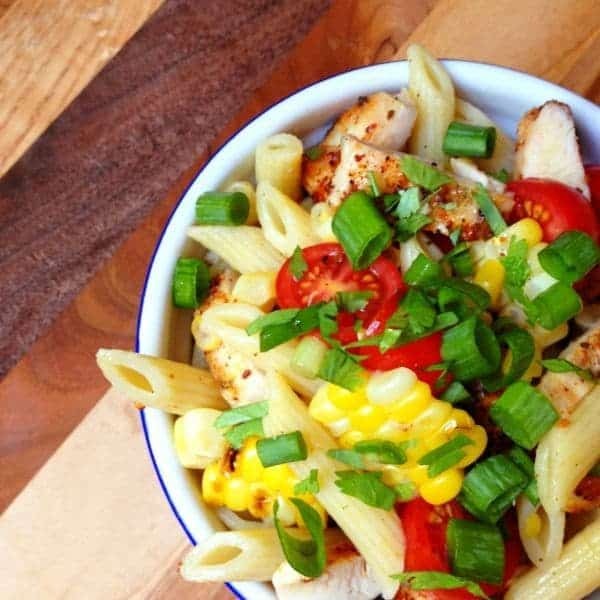 We almost always have leftover cooked chicken breasts on hand (we even used leftover tandoori chicken once!) but any lean protein works including pork tenderloin, tuna, flank steak, you name it. The salad is hearty enough to dress ahead of time but I always recommend waiting until you’re ready to serve. What is your favorite make-ahead lunch idea? I would love to hear from you. Prepare farro according to package instructions and set aside to cool. Place spinach in a large bowl or 5 individual travel containers. Top with chicken slices, carrots, mushrooms, red pepper slices and cooled farro. 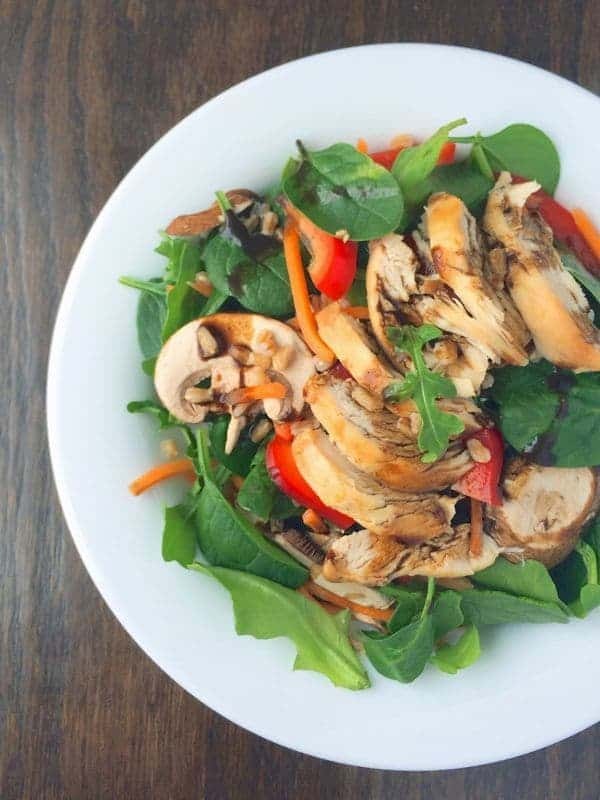 In a small bowl, whisk together balsamic vinaigrette. 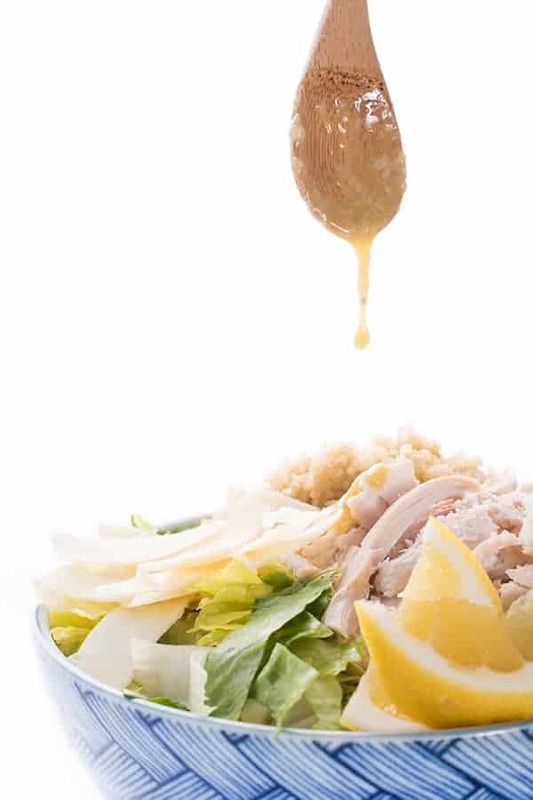 Drizzle over salad bowl if you plan to serve immediately. Otherwise, place in a travel container and dress individual salads as needed throughout the week. Undressed salad can be stored in an airtight container in the refrigerator for up to 5 days. Feel free to mix and match toppings with whatever veggies or leftover meat you have on hand. Disclaimer: I am honored to be a paid Bob’s Red Mill Ambassador. Thank you for supporting the brands that make The Lemon Bowl possible. As always, all thoughts are 100% my own. I was inspired by you when you originally posted pics on Instagram and have been making Larry a version of this salad for lunch last couple weeks! No farro, but I do love farro! I could eat this for lunch every day, especially if it was ready to go! These salads look so colorful, healthy and delicious, Liz! 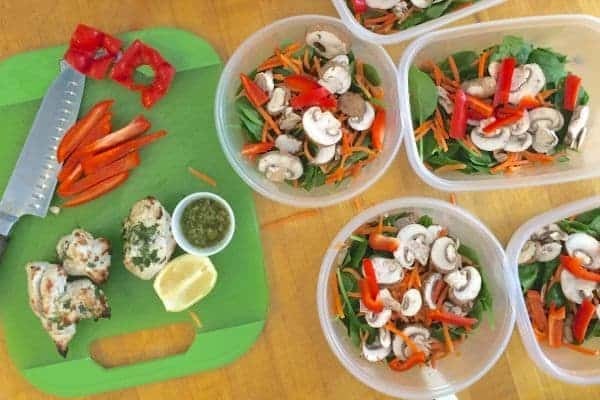 I love that you and hubby have a Sunday ritual of preparing them for the week, too! Aww thank you so much Georgia! Hope you’re feeling good! I love making salads in advanced. It saves me from making a less healthier lunch of cheese and crackers! This looks so good Liz and I love farro! Liz, this looks phenomenal! I’ve only had farro in things like soup but I love the idea of using in salad to bulk things up and make it more filling. I need to add it to soup more often!! I’ve been meaning to try farro. 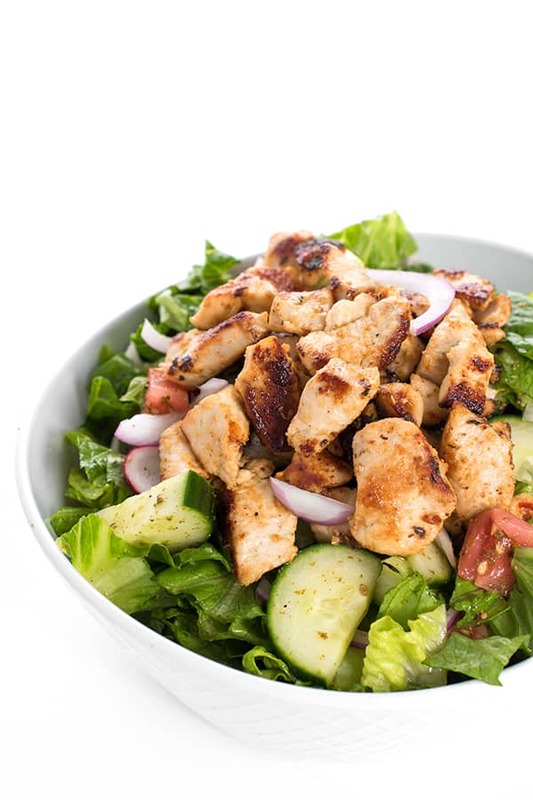 Now I think I will ’cause this salad looks so healthy and delicious. I haven’t tried freekeh yet either. Have you? I’m so into faro right now, it’s officially replaced quinoa in my book, but I’ve never thought to use it in a salad. I like! You and me both Nicole! Wow-this looks fantastic! My mom (who is an amazing cook) used to make farro for us all the time, and I haven’t had it since I was a kid, so I’m definitely going to have to try it in the super yummy looking protein salad! She did?? That’s so cool!! Your mom rocks! Looks yummy – is farro gluten free? Great idea, Liz – thanks! I love a good healthy salad!! This looks wonderful. I have been trying to eat salads a lot more to help loose the baby weight and this would mix things up. Mmmm, I’m obsessed with farro lately. This salad sounds yummy! I am too! Why is it so dang good?! I love having grains in a salad. Definitely ups the hearty factor. I’m loving this particular combo. Can’t wait to try it! I would love this fabulous salad for lunch! I need to start using farro more often. Love this salad. I like to make a big batch every Sunday and use it throughout the week in various places. So good! Loving this bowl of all good stuff Liz! Farro is one of our favorite grains, and we love making salads like this, too…with lots of “goodies” in them, as we say. This combination is one to try!